This book contains interesting reports prepared in view of a conference organized by the Faculty of Law of the Rijksuniversiteit Limburg at Maastricht on the occasion of its tenth anniversary, in September 1991. The objective of the conference `Legal Education in the Future' was to discuss whether one should develop a `European Law School', in which the `ius commune Europaeum' would replace the national legal system as the central element of the curriculum. In all European countries, at present, law and the teaching of law tend to focus on national concerns. Comparative law is mostly concerned in emphasizing the differences between legal systems, and less in searching for common roots and principles. The conference participants were invited to examine the intellectual resources that might allow for a re-direction of the emphasis, towards the teaching of common rules and principles in a `European Law School' accessible to students of all countries and leading to transnational professional careers. 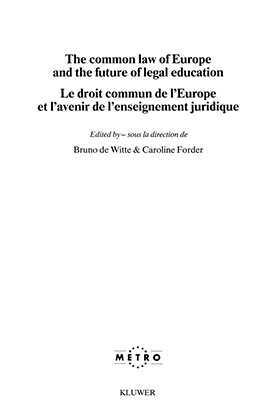 Some of the interesting contributions in this book explain the ambitions and lingering doubts about a European legal eduction. Other contributions have, by their enthusiasm and thoughtfulness, helped chart the way to the future. The following areas of law are discussed: public law, private law, company and economic law, criminal law, labour and social law, and social and scientific views.